The drive from Lago Di Sorapiss was nearly 4 hours to Konigsee lake, which is in the south of Germany, on the border with Austria. We parked in a paying car park for the night ('park a night app') and walked there to the beautiful lake. Will and I had found this rock pool image on Instagram with no description on where it was, we followed the geo-tag, 'Konigsee' - and we were dedicated to finding it! It turns out that this 'secret rock pool', as it states on google, is not so secret, there were quite a few people there! I'm pretty sure if you ask at the tourist information desk 'where are the rock pool and waterfall' are, they will explain better than I can! 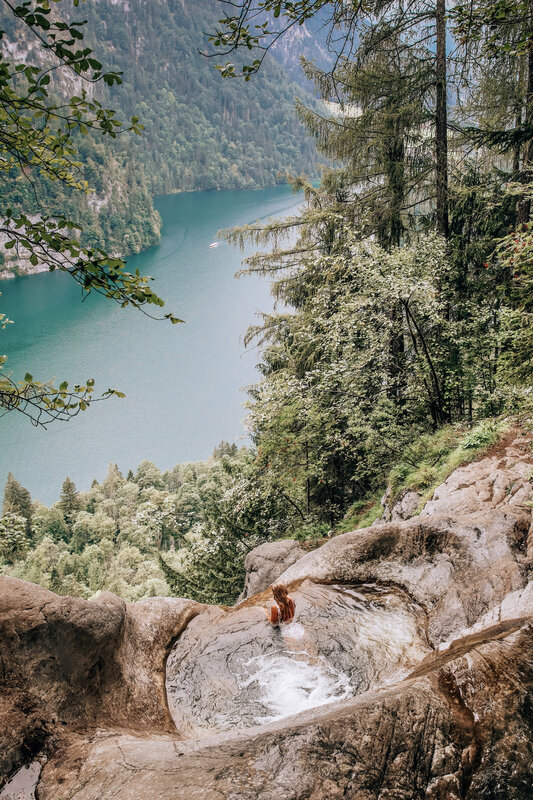 Once parked in Konigsse, you will see the very obvious hiking track around the lake - we followed this up and eventually found the track which led to the waterfall and pools. There are lots of people doing the same thing, so just ask if you get lost. These rock pools are absolutely beautiful, and are set amongst a world of nature. We swam in the freeeeeezing water, relaxed and ate our picnic lunch, it was divine. I recommend visiting this lake, even if you don't manage to find the pools!